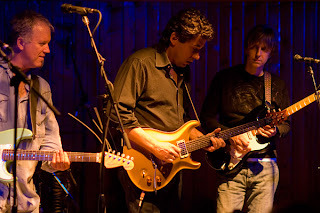 Phil Brown, pictured at far left with David Grissom and Eric Johnson (far right), definitely rounds out a holy trinity of Austin, Texas guitar godliness. 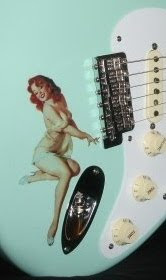 He also joins the esteemed Strat-o-Brother's ranks here, at ridiculous guitar blog central. Phil's latest release "The Jimi Project" is not what you'd expect-- yes, it's a Hendrix tribute with Hendrix covers, BUT, Phil really makes them his own. This is refreshing because I think we can all agree that Jimi was best at doing Jimi. To me, Brown actually sounds more like a Jeff Beck-Bill Frisell mix, if you can imagine. Hey, anything's likely to happen in Austin these days! Brown employs Yellowjackets bass wizard Jimmy Haslip and mondo-veteran drummer Gary Novak for his project. Are you getting curious yet? Strat-o-Sister Colleen Reilly recently turned me on to Phil Brown. Colleen is back in Austin now, having recently completed a learning stint at Berklee in Boston-- Congrats Colleen!! !